I found half a packet of Capellini while clearing the kitchen cabinets and decided to cook it alla carbonara since I have all the ingredients needed lying in my fridge. Boil a pot of water with some salt. Put in your choice of pasta, spreading the pasta out to avoid them sticking together. Boil for 5 to 8 minutes or until al-dente. Drain the pasta, then immediately pour cold water onto it. Set aside. Heat up the pan with the olive oil for 1 minute on medium heat. Saute the crushed garlics, diced onions, bacons (and meat cubes - optional) until brown. Discard the garlics. Sprinkle some black pepper and toss. In a small pot, heat up the cooking cream on low heat. Slowly add in the egg yolks and Parmesan cheese, while stirring it continuously. Add in some salt to taste and bring it to simmer. Note: If the cream is too thick, add in some water. 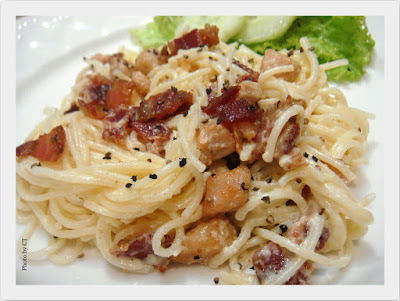 Transfer some pasta and sauteed bacons into a mixing bowl. Pour some cream onto them and toss until the pasta is entirely coated with cream. Transfer the pasta onto a serving plate, seasoned with more black pepper (optional) and serve with fresh green salad at side.